My first time in Ohio, and I’m gearing up for an eventful 10 weeks. After slightly more than two weeks in Cleveland, I’m acclimating to the strange, curvy roads and unfamiliar grocery store chains. I’m less put off by the one-way streets, and I’ve finally memorized my new zip code (44115, if you were wondering). I’m settling into my internship at the Plain Dealer, and I’ve got my workout-work-dinner-bed routine down pat for the weekdays. Now, I’m looking for some weekend festivities. But as the title of this post alludes, it won’t be fun of the Hastily Made Cleveland Tourism video variety. (Which, if you haven’t seen, you need to watch. Now. Hat tip to Karen Miller for introducing me to those few minutes of absolute, tear-jerking hilarity). Anyways. I’m used to research. A lot of what I do as a journalist involves searching, reading and finding out all kinds of information. From store closings to the minutiae of lawsuits, I’m getting pretty darn good at finding stuff out. But that hasn’t stopped me from feeling a little intimidated by a brand-new city (and state, for that matter). So after perusing some helpful blogs about why I should love Cleveland, I’ve developed a short list of goals for the summer (beta version). Any and all suggestions are welcome! 1. Make a habit of visiting the beach. Huntington Beach in Bay Village, OH. Yes, I live 20 minutes from somewhere this beautiful. This one is kind of a no-brainer. As you can see, I’ve already spent some time at Ohio’s beautiful Huntington Beach, and I can’t wait to go back! Clean, reasonably uncrowded and only a short, breezy drive on 90W away, I can see myself spending a ton of time here to relax. I could be the exception, but I have a feeling I’m not the only newsroom-bound journalist who clamors for some sun when the weather gets nice. Plus, this beach has an ice cream parlor on-site. Perfection. As long as I’m talking about ice cream…I stumbled upon this delicious-sounding gem in my “find-out-what’s-awesome-about-cleveland” blog search yesterday. Ice cream and french fries? Plus it’s open late? And all homemade? Aside from the classic Chicago combo of Portillo’s milkshakes and fries, I’ve never had anything approaching this level of greatness. Friends, you, too, should hope this is as amazing as I hope it will be. Why, you ask? Well, if you visit me, I’ll treat. 3. 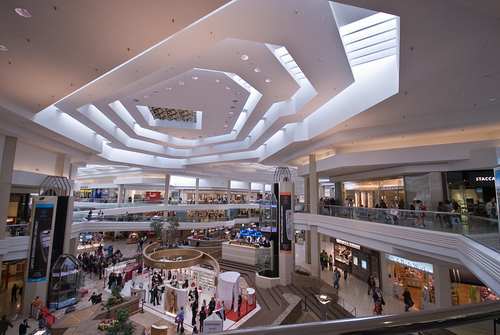 Beachwood Place Mall. Because if it has a Nordstrom, I’m so there. Ok, so this one isn’t necessarily Cleveland-specific. But as a Schaumburg native, I am almost contractually obligated to seek out other malls and report back to the motherland. 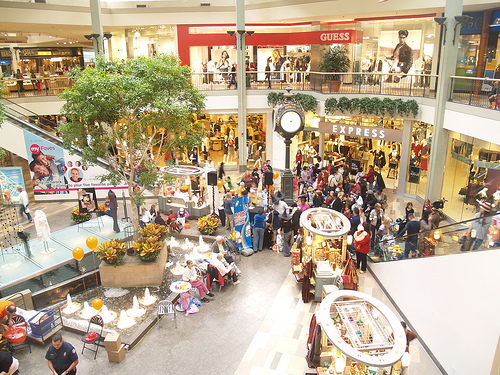 Beachwood (left) might not quite compare to Woodfield (right) as far as grandeur, and it will certainly never smell of childhood and formal-dress-hunting success like Woodfield does, but I’ll do everyone a favor and find out. And if I pick up some work-appropriate skirts along the way….so be it. 4. Fill my farmers market quotient at West Side Market. It’s no secret I love food. 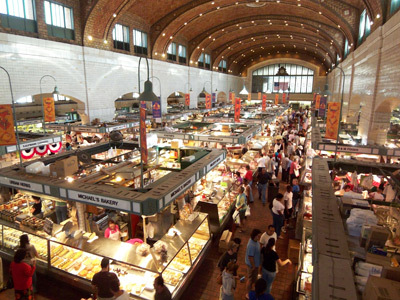 So what better than 100 vendors showing the best fresh and prepared food downtown Cleveland has to offer? I’ve only heard great things about this market, and I can’t wait to check it out this weekend. Thankfully, tomorrow is payday. 5. Visit the Rock and Roll Hall of Fame. 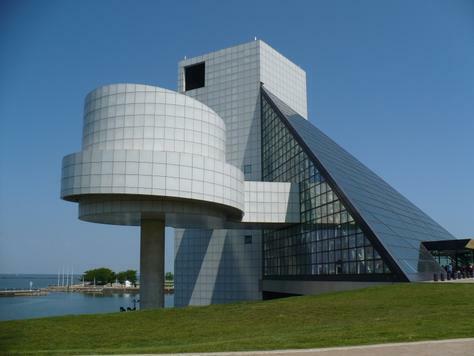 Modern and spaceship-esque, the Rock and Roll Hall of Fame is probably my dad’s favorite part of me living here. I think my dad is even more excited about this than I am. Having been raised on Elvis, the Beach Boys, the Beatles, Paul Simon, et al, I’m surprised my museum-loving family didn’t make the trek out to Cleveland to see this earlier. I don’t quite know what to expect exhibit-wise, but the building looks beautiful, and an outing is an outing! Great Lakes Brewing Company, thanks to Columbia, I’ve learned that non-pretentious menus and locally brewed beer are not to be passed up (cough, Flat Branch). Hodges, this steakhouse looks a little out of my price range, but I mentioned my dad was visiting, didn’t I? ….kidding. Little Italy, I don’t know enough to have chosen a place here yet, but I’ve driven through it, and it’s so cute and charming. I’m sure great food is to follow. Popcorn Shop, nestled in the adorable Chagrin Falls charming-town (my mom’s preferred term for places such as these), this shop was recommended to my by a photog in the newsroom. Admittedly I’m a butter-and-salt-only-popcorn kind of girl, but I’ll be adventurous. That rounds out my immediate to-do list, but I know I’ll discover a lot more as I get to know the city better. Been to Cleveland? Do something cool while you were there? Let me know! Until next time, I’m flexing my cooking muscles and workin’ for the weekend. This entry was posted in Uncategorized and tagged beach, Beachwood Place, Cleveland, Hodges, journalism, Little Italy, Middleburg Heights, Nordstrom, restaurants, Rock and Roll Hall of Fame, Schaumburg, summer, Sweetie Fry, Two Bucks, Woodfield Mall. Bookmark the permalink. Look at you showin’ us all around your new city. Looks like you’re going to have a lot of fun!! 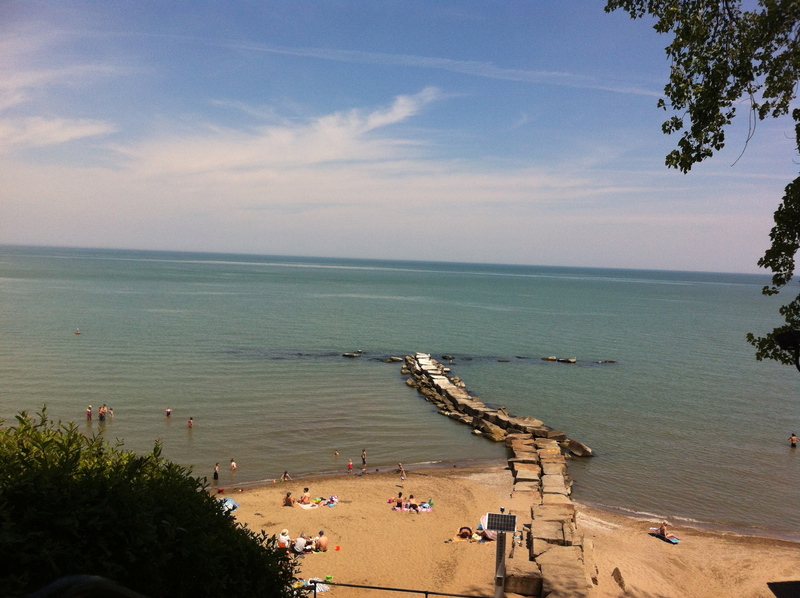 Who knew Ohio has a beach? The Nauti Mermaid was good (if you can ignore the awkward name…). My dad and I went there when we stopped in Cleveland on the way to Maine. Hope you are loving the new job! 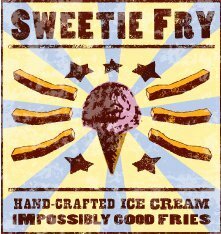 Although you are incentive enough to visit Clevelandtown, Sweetie Fry sounds like an added push. I definitely think you should make a Cleveland Tourism Video Part III.